Geographer Jay Appleton (1919-2015) and photographer Simon Warner join forces to present a photographic guide to Prospect-Refuge Theory, the system of environmental aesthetics developed by Jay Appleton in his book The Experience of Landscape. Professor Appleton proposes that aesthetic taste in landscape and landscape art derives from primitive, hunter-gatherer instincts for vantage and viewpoints (Prospect) and shelter or concealment (Refuge). Humans, as well as other animals, select environments that contain a favourable balance of these two elements. With the advance of civilization our survival instincts have evolved into feelings of pleasure at landscapes (or pictures of them) that would make good habitats if we had to depend on them. The exhibition answers the question Professor Appleton poses at the start of his book: ‘What do we like about landscape and why do we like it?’ in a series of photographs exploring his key categories of Prospect, Refuge and Hazard, accompanied by a narrative commentary and detailed captions. Hazard is particularly important to the theory – all places of refuge involve hiding or sheltering from something and environmental perception is all about weighing up risk and advantage. With Hazard we touch on the Sublime, the urge to probe the uncomfortable and dangerous that is such a cornerstone of Romanticism. Simon Warner’s colour photographs depict views across England, Wales and Scotland, and the exhibition ends with a group of pictures on which visitors can try out their own newly-acquired skills of landscape interpretation. Extracts from Jay Appleton’s recent poetry also feature, offering a literary perspective on his theories and underlining the essential cross-disciplinarity of his thought. If Jay Appleton’s environmental aesthetics have hovered just below many people’s radar, they have also been taken up in diverse quarters. Landscape architects were quick to see the significance of ideas that offered a universal explanation for people’s landscape preferences. In the USA Prospect-Refuge Theory influenced the environmentalist and philanthropist Prentice Bloedel, whose Reserve on Bainbridge Island in Puget Sound near Seattle is a mixture of public garden and forest park. Meanwhile in his book The Wright Space (1991) American architectural historian Grant Hildebrand demonstrated that Jay’s landscape model can apply equally to the domestic interiors of Frank Lloyd Wright. In Landscape and Memory (1995) Simon Schama acknowledges Jay as one of the two thinkers largely responsible for the revival of cultural geography in Britain. And more recently the philosopher of art Denis Dutton credits Jay with re-initiating an enquiry into the pervasive attachment all species display for their natural habitat – ‘one of Jay Appleton’s most original hypotheses continues to be compelling: his idea of Prospect and Refuge’ (The Art Instinct 2009). A tributary of the River Thames, the Windrush meanders across water meadows. 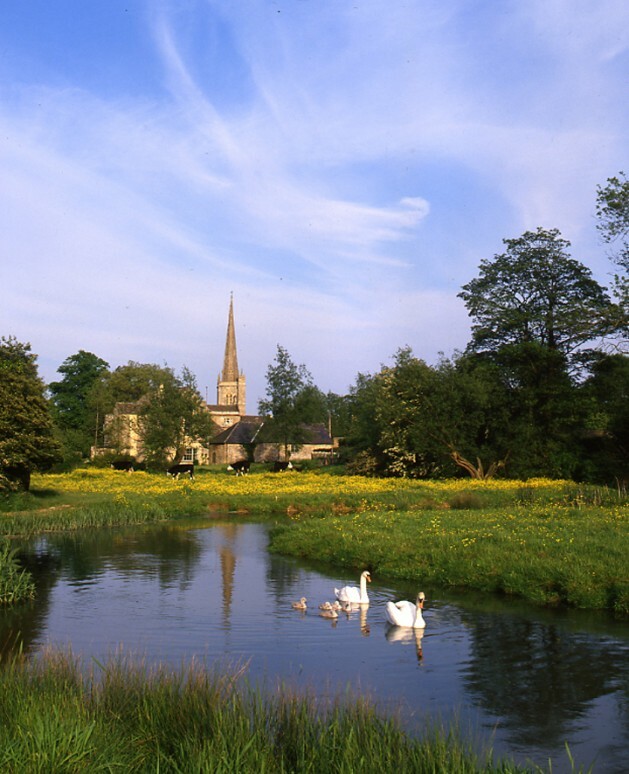 Until the early 20th century irrigation of the meadows was controlled in order to improve agricultural productivity. This peaceful scene belies the importance of the river as a source of clean water and power for the woollen industry which became established in many of the small towns along its course during the Middle Ages. The picture is an example of an Indirect Prospect, where an alternative vantage point (in this case the church spire) appears likely to offer an even better view. It is also a Deflected Vista in that the course of the river beyond the bend has to be inferred. Both these pictorial elements are prompts to our curiosity. The picture also shows the operation of a particular Habitat. The swans will have found sufficient refuge in the reeds and grasses to build a nest, and are now exploring the surroundings with their cygnets. The environment is not entirely safe, as they are vulnerable to attack from hungry pike as well as from human interference. But the river can supply all their food, and the balance of advantage and threat is in their favour. The huge mass of Blà Bheinn rises abruptly from Loch Slapin. Composed of gabbro, a very rough black igneous rock, it is a favourite with mountaineers. Glacial ice cut the deep valley now occupied by the loch. 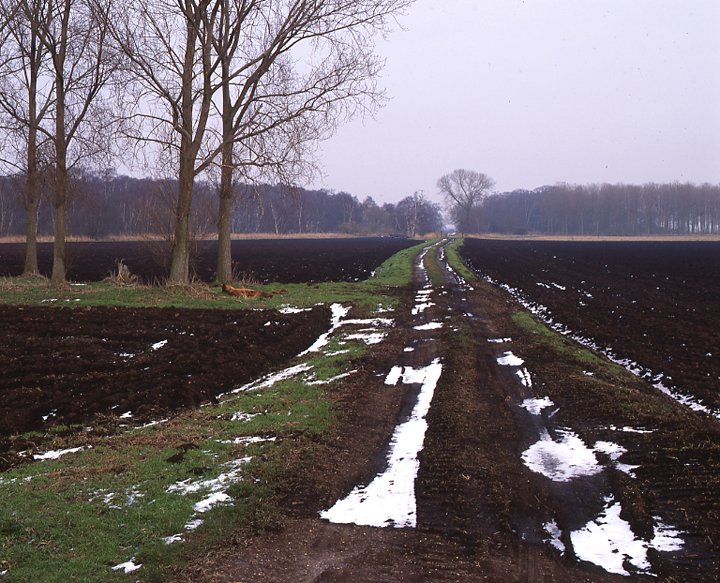 Much of the land is rocky and soils are poor and thin, but here a small area of flat land has been cultivated. In Prospect-Refuge theory Reduplication is said to apply when one symbol is supported by another of the same kind, as when a tower is built on a hill (Prospect) or a house is surrounded by trees (Refuge). The house here is protected by a shelter belt, and the mountain too seems to offer a sheltering wing. 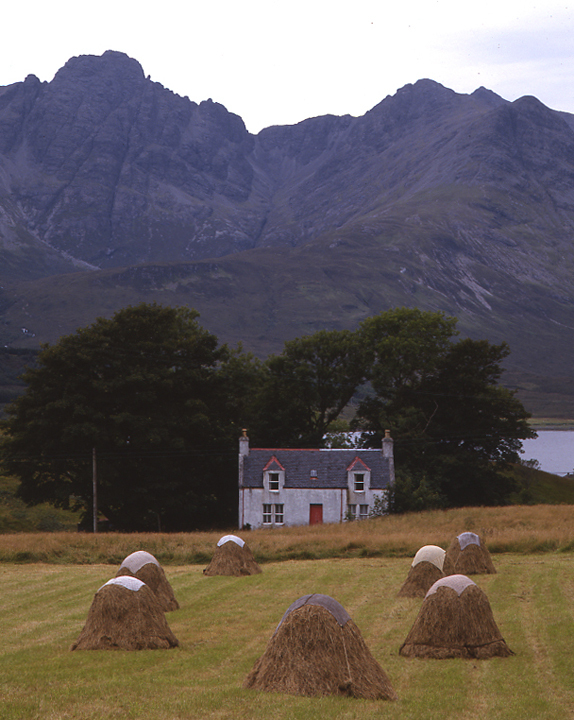 The loch may serve the function of a moat, keeping unwanted visitors away from the hay crop (indicating plenty) in the foreground. These potent Refuge symbols reduplicate each other visually to create the strong suggestion of a desirable habitat. 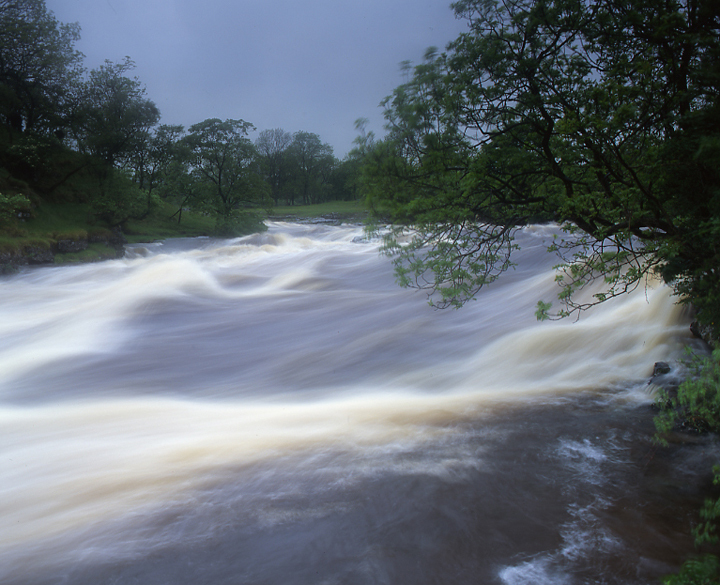 Here the River Wharfe forms a series of rapids as it breaches a ridge of Carboniferous limestone. The river drains a large area of permeable limestone and so responds quickly to rainfall, making it one of the fastest rising rivers in the country. Until the 1850s Holme Fen formed part of Whittlesey Mere, and was one of only a few Fen landscapes to survive the drainage schemes of the 19th century. It is now the largest area of lowland silver birch woodland in England, and contains the lowest point in Great Britain, 2.75 metres below sea level. Holme Fen is key to the Great Fen Project, which aims to reconnect remaining pockets of fenland and create a major wetland area between Peterborough and Huntingdon over the next 50 years. The broad raised track offers a reassuring prospect of access to the shelter of the wood, avoiding any need to cross the Impediment Hazard of ploughed fields on either side. The edge-of-the-wood is an important site in Prospect-Refuge terms. It typically offers unimpeded outward views from the refuge of tree-cover, thus fulfilling the desirable condition of seeing without being seen. This is a striking example of a Panorama with a reach or ‘fetch’ of over 45 miles. The picture here relies on the clarity of the light and illustrates the advantage of falling ground. The immediate foreground is free of vegetation that might impede the prospect, but we are assured of the proximity of refuge by the line of the treetops, high enough to catch our attention but not to interfere with the prospect. The tidal River Trent enters from the left in the middle distance, joining the Yorkshire Ouse at Trent Falls (a misleading name, as there are no falls as such) to form the Humber. Until the opening of the Humber Bridge, some 7 miles downstream in 1981, this water-body interposed a formidable barrier between Lincolnshire and Yorkshire. The panorama illustrates well how landscape is a product of the interaction between nature and humans. The fields bordering the rivers are natural floodplains reclaimed as productive farmland and divided by hedgerows providing linear pathways for the movement of wildlife. Since this picture was taken in 2003 the whole middle distance has been given back to the estuary and restored as floodplain in one of the Environment Agency’s largest realignment projects, providing a cushion against tidal surges. However the storm surge of 5 December 2013 caused severe damage to the infrastructure of the site, with fences being carried up to 1km from their positions by the force of the water. The foreground platform, on the edge of the Jurassic escarpment, showcases a rare example of a mystery puzzle to challenge our curiosity. Julian’s Bower is one of a number of turf mazes in England whose origin, date of construction and function has defied investigation. Like many ancient sites it is situated at a dramatic viewpoint, suggesting ceremonial or observational importance. What we can be sure of is that instinct demands we carry on questioning. All the photographs in the exhibition can be ordered as individual archival prints on photographic paper. Please email photos@simonwarner.co.uk for payment details. Jay Appleton’s seven volumes of poetry are all available online or from the publisher Echo Library.